Sorry for starting another 980 TI thread, but I wanted to see what kinds of results everyone was getting with their cards. I picked up two reference Nvidia 980 TI's to run in SLI and they overclock better than just about any card I've owned in the past! In fact, when the cards are directly next to each other in SLI, I can't really push the top card to it's potential limits because 100% fan speed barely keeps it under 80C (trying not to run them hotter than that for very long). I am in the process of water cooling my rig and I'm really excited to see how far these will go with proper cooing. I don't plan on testing the cards individually since I'm already really happy with the results and I'd rather just get to installing the water blocks. I will update my results again and post some pics when I get everything on water (it's my first water build and feels like it's taking forever). Please post some of your own results; I'm really curious to see how everyone's overclocking is going! Same here: EVGA reference card with OCN 425 bios on water block. Max temp : 50C. Room temp : 24C. 1,237v. Have been on 1480/7900 rock solid since Wednesday. Tried 1500 for the last few hours : seems to be stable too. Tried a brief OC session. Your "stock voltage" must be insanely high as have not seen a single 980 Ti be able to maintain anywhere near your claimed 1490. Stock voltage is usually about 1.168 to 1.180 once the card levels off and there is no chance you get anywhere near 1490 at that kind of voltage. EDIT: I deleted the first part of my comment about the score as I did not notice it was SLI. Here is a screenshot from Precision. OSD reports 1490 on GPU1 and 1489 on GPU2. On the reference cooler? That just does not make any sense at all. You must live in an igloo. Overclock is stable in Extreme, not stable in normal Firestrike. Working on stable Firestrike. 72F room, fans at 65% and GPU temps are 65C. GPU temps only 65 C? Reference cards? Everything you are claiming goes against EVERY single review. Is anyone using different voltage offsets for each card to overcome the V disparity? I assume this is still an issue since it affected both 970 and 980 cards. It seems like only cards that are extremely close in ASIC ratings are fully compatible, voltage wise. I am not going to even bother trying to overlock on this reference. I'm not getting any disparity between my cards, but my cards are identical in ASIC quality. My 980's on the other hand, were always different, even though their ASIC were offset by 1.5%. Wow that low... I reran my tests on air (Fire Strike Extreme) and was boosting on card 1 to 1527 and lowered to 1513 after temp hit 64c. Card 2 was boosting to 1539 and dropped to 1526 after getting above ~62c. Individual testing for each card. Should be able to get more than 1480 on water.. I'm shooting for 1600 on mine with 1.281v BIOS. 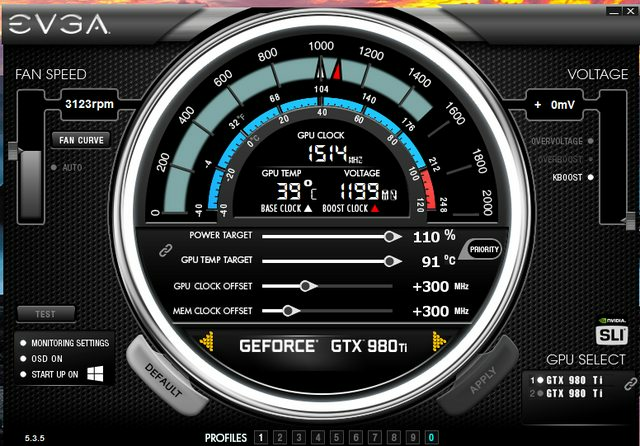 Still testing, but on my Gigabyte G1 980 Ti I'm getting stable boost clocks of 1500 at 130% power limit and +87mv voltage, with temps around 77 degrees. Without upping voltage it goes around 1400. I'll see if I can keep it stable while dropping the voltage a bit but at the moment it is hitting the voltage limit. Gigabyte G1 980 Ti @ 1530/7900 stable with a custom BIOS I configured for 1.28v and 425w power target. My ASIC is low at 65% so it definitely needs the extra voltage bump for these speeds, stock I was maxing out at 1480 stable. With a custom fan curve maxing at 80% the temp is floating between 69-71 C on the custom BIOS at load while still being fairly quiet. Very happy with this card all things considered. Gigabyte G1 980 Ti @ 1530/7900 stable with a custom BIOS I configured for 1.28v and 425w power target. What kind of temps are you getting? Did you disable boost? Could you maybe post your BIOS for download somewhere. I seem to have a hard time getting stable above 1500. The best I get at the moment is 1504. Thanks! What settings are you running in AB? Max power, +200 on the core, +400 on VRAM. You don't need to touch voltage in AB as that will already be set by default at load. Thanks, tried your BIOS but it doesn't work well for me. Runs fans a bit too high for my tastes and my card couldn't reach the clocks you have without crashing. I guess I didn't luck out and get a great overclocker. Oh well, I think I'll go with around 1500 as going above that is unlikely to give me much more performance anyway. What you might want to do instead of flashing direct is just take the settings I've got in there, save your own BIOS and modify it using MaxwellBIOSTweaker 1.36 based on those settings. Gigabyte is known for using a variety of different BIOS even for the same model of card so it's possible yours is using a different revision. Also I didn't modify the fan settings at all within the BIOS. The automatic fan speed seemed to go much higher with yours. The BIOS did seem to be the same revision as I have. What seems to work for me is to limit the max boost to around 1506. Going above seems to result in crashes after a while. Yeah, it sounds like that might be your limit if the voltage boost didn't allow you to increase the core at all. Still a pretty decent overclock. You might try Laithan's BIOS out to see if that works better for you. His is based on F3 revision as well. Nevermind, see it's water. Nice clocks! Which blocks are you using? These settings are game stable (so far) but generate the occasional artifact so I run with the GPU Clock Offset at +280 (1495MHZ Boost Clock). Eventually I'll try out a custom BIOS from OCN and see if this improves. Can you give some more details on where you found this firmware and how you flashed it? I'm hoping to do this soon. I got 4922 Firestrike Ultra running at 1515/7400. It can easily oc more but this freaking MSI Gaming card has 109% power limit which is killing the full potential. if you have enough cooling headroom, send me your BIOS I can make a custom BIOS for you with higher Power target and higher Stock + Turbo clocks with no throttling, or also you can download maxwell Bios editor and try yourself if you feel more confident. im actually still working in mine and im at 1606mhz core/8000mhz memory and the card just think this is stock clock, so no throttling ever.. Thanks but to be honest I would not be comfortable touching the bios. And over 1600 on your card? The power consumption is probably insane with that overclock. What's odd is in the guru3D review of my card, the reviewer showed a 120% power limit in afterburner. 109 is what every one with a retail card is getting though as for as I can tell. I even see someone already asked about that there in the comments but of course the reviewer never replied. It is pretty misleading to have a card with higher power limits sent to reviewers. did you tried the MSI gaming APP and select the "OC Mode" you can download it here MSI Gaming APP a lot, if not, all people tend to forget that app, which really make a whole different world with the card. I have owned numerous MSI cards and know about it but did not want to full with it since I would be doing the ocing with afterburner. So you think using that app and running OC mode would make the power limit higher for afterburner? EDIT: No that did not do anything for power limit. The app basically useless for ocing as it only has the 3 modes. Honestly I thought the OC mode allowed higher Power Limit and higher clocks even in memory.. They don't necessarily mean different thing. It could be that some BIOS revisions have higher base power. Percentages don't mean anything without knowing what 100% means for both cards. There has never been another situation like this that I have seen and I have used tons of Kepler and Maxwell cards. They all had the exact same power limits as was shown in their respective reviews.